Wind: Variable and frustrating for which end to launch from. Altitudes: Morgan and Chris reached 10,000 msl. Time Aloft: Over two hours. Max Lift: Perhaps 400 fpm but also a mountain wave formed. It was an interesting day both weather wise and lift conditions. The breeze was calm at first, then changed out of the southeast but sporadically enough to continue launching on runway 31. Later, sometime after noon the wind came up again from the southeast a bit stronger. 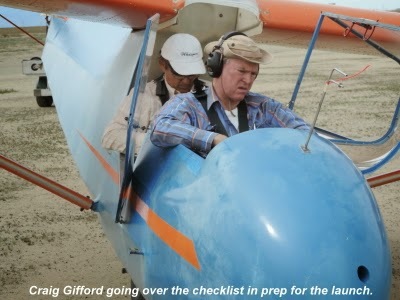 Dan Gudgel decided to switch the gliders to the far northwest end and launch on runway 13. Just about the time they got there and got situated, the wind shifted again out of the northwest favoring runway 31. Rather than shifting again they decided to remain there and deal with the tailwind. Not too many launches later the wind began blowing hard directly across the main runway and stayed that way most of the afternoon. It seemed the correct direction for a mountain wave to form and some of the pilots chose to seek out the wave lift. Not much to report on that although there was speculation all day that maybe we had been experiencing a convergence line that moved from the southeast toward the northwest and then expanded out into the Valley. 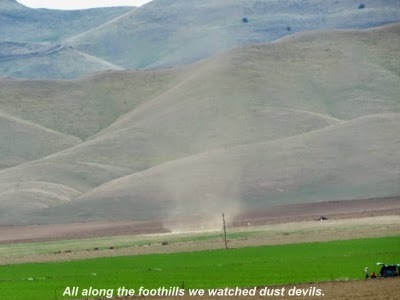 All afternoon we observed dust devils forming along a line just east of the foothills and that line extended up to the town of Coalinga. So perhaps it was a bit of a rotor formed by a weak wave off the mountains to the west of Avenal. 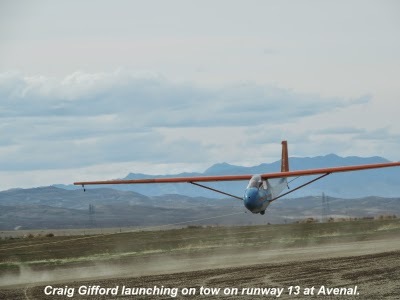 Craig Gifford, our newest member, trained with Alex Caldwell most of the day, and managed to try out some pretty stiff crosswind takeoffs and landings. Allen White was our towmaster today and did his usual superb job of towing us wherever we wanted to go. He also handled the stiff crosswind with ease, Thanks Allen. 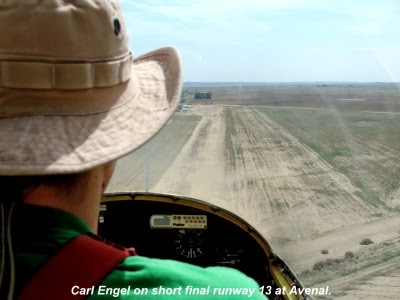 Today marked the final day of training for Carl Engel who will be taking his Private checkride on April 12th. He holds a Private license in Helicopters and will be making this his add-on rating. He's ready for the test. Dan Gudgel had some folks come out from Lemoore for visiting and demo rides. The kids rode but the adults just enjoyed the afternoon watching and helping with the launches. With the annual complete on 5H, I helped get people launched with the last of the fuel before Harold and Carl got back from a Fuel Run. Between wind switches, lack of fuel and other timing woes it was getting late and new member Chris Reilly was at the back of a growing line waiting for an instructor and glider. I offered to take him up in 5H for a soaring flight, or whatever we could find. The convergence was 15 miles east at this point and although there were clouds near Coalinga, the cirrus was thickening and the dust devils dwindling. Winds were now 90 cross at about 12kts. We opted to launch 31 and Alan was willing to drag us off in that direction. 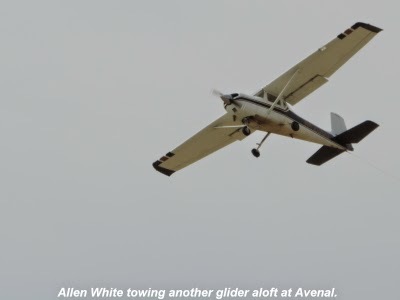 We launched unassisted and with the stiff crosswind, it was no problem getting the low wing up and tracking behind Allen watching the dust fly sideways from the tires. After an orbit of the field Allen took us towards the Kettleman Hills where Andy was finding lift to 4k. At 2500 we hit a solid thermal over the dump and I got off. We worked and worked to get to 3k. Pushed NW and found a climb to 3200. My intent was to just press towards Coalinga and the clouds we could see there. A few dust devils still were forming about 7 miles NW of Avenal. The farther northwest, the higher we could climb. Able to stay above 3k, I handed the glider over to Chris. I would call tactics, he'd do a lot of the flying. 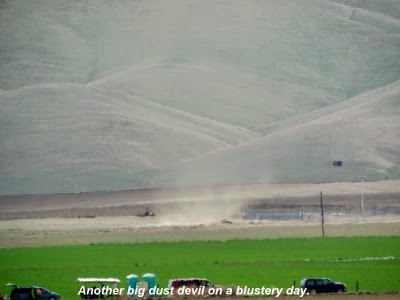 I spotted a dust devil at the gravel pit and had Chris dive for it. Sure enough we were rewarded with a good climb to over 5k. We used this to edge a little more towards Coalinga and then spotted a fresh cloud forming to the SW. We pushed SW pretty much straight into the wind and finding lift. Short of the cloud we nabbed a climb to 7k. Then made it to the cloud and back over 7k. This was enough to bridge the gap to the ridge west of Coalinga and the clouds there. We didn't find anything at the first few wisps and I took over to fly us deeper into the mountains. We still had plenty of altitude and could make it back to Avenal, but I didn't really want to work harder than necessary. After finding a climb under a nice looking Cu up the valley towards Herndandez Reservoir I decide to jump cloud streets to a very well developed one to the SW over Center Peak. Leaving our cloud at about 7k and heading into the blue, I found lift. We had 12kts of SW flow, but here I was in the gap between cloud streets and climbing 4 knots flying straight. I told Chris I suspected wave and was going to turn. We didn't need to, we were already almost too high for the lower cloud street to the west, but I usually don't turn down the opportunity to explore a variation of lift. Especially on a late afternoon flight that I'm not really trying to go anywhere in particular on. Well above cloud base now. Probably 9000. We circled a few times out in the clear air and soon were climbing above cloud base in front of the cloud we had thermalled up under. A few more circles and I shifted to more figure eights and began to explore the limits of the lift. It seemed to be an area a mile or two in length and pretty broad. On average we only climbed at 2 knots and less as we neared 10k. At 10k, winds were 22kts. Classic wind gradient to propagate wave even though the ridge height winds were fairly light. Looking SW towards the Center Peak ridge. Center is just behind the right wingtip. It is still a treat to transition from a thermal flight in wind to a wave flight. To the NW, the wave petered out and the foehn gap closed. We had lots of space in the clear air and easy routes to the south. At 10k, we were cold. Chris was in shorts and a t-shirt. We explored SW over into Priest Valley to see if the upwind line of Cu had a wave in front of them. They didn't. 10k and about 28 degrees. 90 cross at 12 knots plus. Do I want a left cross or a right cross?" I opted for a right crosswind so we could roll out generally close to the trailer. Dan and Chris helped me get the glider tucked away safely before we all headed home.